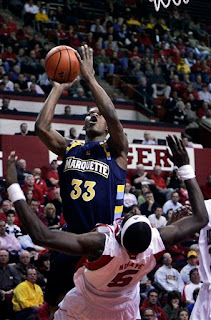 Marquette Barely Knocks Down Rutgers ~ The Bucky Channel - The World of Sports from Wisconsin's Perspective. Wednesday night was a huge night of basketball in Wisconsin, and we'll start with Marquette. The Golden Eagles were on the road tonight taking on a Rutgers team that has been playing average at best this season. The result could have been better, but Marquette will be happy to walk out of Piscataway, New Jersey with the 81-76 victory. It looked like Marquette was going to get an easy victory early on in this one, but the Scarlet Knights just wouldn't surrender. The hero was Wesley Matthews, who was 10-10 from the field in a 23 point effort. Jerel McNeal added 16 for the blue and gold, while Dominic James added 15. The win keeps Marquette atop the Big East standings with a 3-0 record in conference play. Their Big East schedule now starts to get tougher, as they'll face #22 West Virginia this Saturday morning. Marquette just needs to keep winning as much as they can right now, as their schedule only gets harder as the year goes on. The easier section is right now, with two matchups against DePaul in the next month. The part of the schedule I can't wait for is the last five games: @ Georgetown, vs. UConn, @ Louisville, @ Pittsburgh, and vs. Syracuse.